The sheep are waiting for their haircuts! 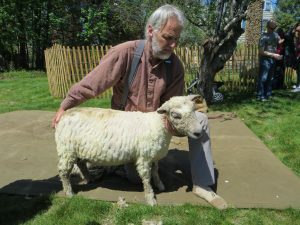 Please see our post for details on our Sheep to Shawl Festival on April 28. June 2 Come Celebrate Flag Day! Master Shearer Jeremy Mills & his next customer. The museum is available for group tours during the week as well as for special community programs. Please call or email.